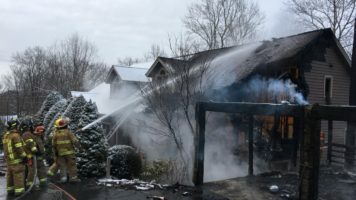 Fire crews from Blowing Rock, Boone, Foscoe, Meat Camp and Cove Creek responded to an early morning structure fire in Blowing Rock on Sunday. The fire just before 4:30am, at 338 High Willhays Road, involved a townhouse, according to scanner dispatches at the time. WSOC-TV later reported it was an unoccupied vacation home. Crews were on the scene more than four hours extinguishing the blaze.